POY commit to produce all Fitbit accessories products at high-quality but very competitive price, such as Fitbit TPU replacement bands, Genuine Leather bands, Stainless Steel bands, fitbit screen protectos, and other fitbit accessories or cellphone accessories. Welcome to visit and ask questions if you are interested. POY Fitbit Charge 2 wristband are fashionable and comfortable; Perfect replacement for your original Fitbit Charge 2 band. More color choices than original Fitbit Charge 2 band and make your Fitbit Charge 2 more elegant. 1. DO NOT soak in water, so as to avoid stiffening caused rupture. 2. Take off the leather band to make it ventilate after exercise. 3. Take care of the leather bands to make them accompany you for a longer time. Warranty: Any dissatisfaction is 1 year guaranteed with a replacement or full refund. We checked all the items carefully before the shipping, however, it might be broken during the transport. If you receive defective items or meet any other problems, please feel free to contact us, we will give you a satisfactory reply within 24 hours. Genuine Leather Material - POY replacement bands for Fitbit Charge 2 are soft & comfortable to wear. Seamless Assemble - Designed with metal clasps on both ends, ensure the security of locking onto the Charge 2 smart watch. Adjustable Sizes - For 5.5"-8.1" wrist size; Pin buckle makes you easy to adjust the length according to your wrist circumference. 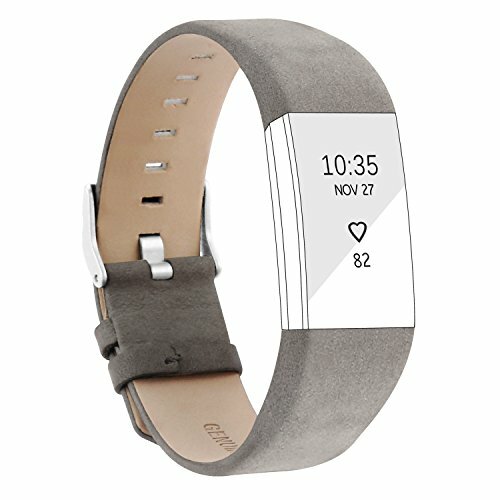 Multiple Choices - Stylish leather wristbands for Fitbit Charge 2 highlights your unique taste and fits your different daily outfits. Free Warranty - All replacement wirstbands for Fitbit Charge 2 are provided one-year Money Back Guaranteed. If you have any questions about this product by POY, contact us by completing and submitting the form below. If you are looking for a specif part number, please include it with your message.